Disconnect the reservoir tank inlet hose (1) from the reservoir tank (2) and drain the engine coolant. Remove the reservoir tank (2). 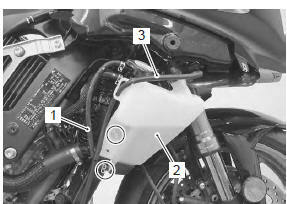 Disconnect the reservoir tank overflow hose (3). Install the reservoir tank. Refer to “radiator / cooling fan motor removal and installation” . Fill the reservoir tank with engine coolant to the upper level. Refer to “cooling system inspection” in section 0b . Install the right side cowling. Refer to “exterior parts removal and installation” in section 9d (page 9d- 6).